If you think there are a lot of industrial robots out there, you’re right. But, by 2019, more than 1.4 million new industrial robots will be installed in factories around the world – that’s the latest forecast from a report published by the International Federation of Robotics (IFR). The number of industrial robots deployed worldwide will increase to around 2.6 million units by 2019. That’s about one million units more than in the record-breaking year of 2015. Broken down according to sectors, around 70 percent of industrial robots are currently at work in the automotive, electrical/electronics and metal and machinery industry segments. In 2015, the strongest growth in the number of operational units recorded was registered in the electronics industry, which boasted a rise of 18 percent. The metal industry posted an increase of 16 percent, with the automotive sector growing by 10 percent. The US is currently the fourth largest single market for industrial robots in the world. Within the NAFTA area (US, Canada, and Mexico), the total number of newly installed industrial robots rose by 17 percent to a new record of some 36,000 units (2015). The leader of the pack was the US, accounting for three-quarters of all units sold where 5 percent growth was recorded. With a comparatively much smaller number of units, the demand in Canada increased by 49 percent (5,466 units), while that in Mexico grew by 119 percent (3,474 units). With a stable economic situation, it is expected that North America will see average annual growth of 5 to 10 percent in sales of robots through 2019. Held every two years at McCormick Place in Chicago, the International Manufacturing Technology Show (IMTS) is the one of the largest (over 110,000 attendees), most comprehensive (~2,400 exhibitors), and longest (six days) manufacturing shows conferences in the world, certainly North America. 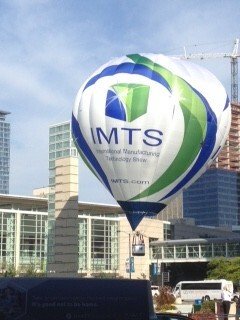 This year’s event marked IMTS’s 31st edition. First timers and long timers are overwhelmed by the sheer size of this event. At over 1.3 million square feet, you better dress comfortably and prepare for an overload of manufacturing technology sights and sounds. Because IMTS is so comprehensive and massive, planning is everything, and as you walk around the various pavilions, you start to get a sense of trends and likely future impact of just about all of the technological aspects of design, engineering, and manufacturing. Below are the major manufacturing trends that I experienced this week. Starting next week I’ll detail what I considered to be the most significant technologies and products showcased at IMTS this time around. Next week, I’ll also go over the major software developments that were introduced — mostly CAM, but some significant stuff. Simulation has received an increasing amount of attention through acquisition and integration with the CAD world. There have also been cases where simulation companies have acquired CAD technology. In any case, simulation has been a very active area in the realm of engineering and design technologies, and for good reason, simulating designs early saves money and headaches later in the design process. National Instruments (NI) is an especially interesting simulation company that develops NI LabVIEW software as its flagship product. I have followed NI for several years and really got interested in the company with LabVIEW 8.5 being used alongside SolidWorks. LabVIEW has followed a natural progression in the evolution of the NI product line for designing and prototyping complex systems, including robots, that are becoming increasingly pervasive in the world around us, and not just manufacturing environments anymore. LabVIEW (short for Laboratory Virtual Instrument Engineering Workbench) is a system-design platform and development environment for a graphical programming language from National Instruments named “G” (not to be confused with G-code used in CNC machining). Originally released for the Apple Macintosh in 1986, LabVIEW is used for data acquisition, instrument control, and industrial automation on a variety of platforms. The latest version of LabVIEW is LabVIEW 2015, released in August 2015. During the course of a year I get the opportunity to attend several events and meet a lot of new people involved with various aspects of design, engineering, and manufacturing. This week I attended an event called “3D Printing Day @ CSU.” Held on the campus of Colorado State University, it showcased the Idea-2-Product Laboratory, the brainchild of its director, and our good friend, Dr. David Prawel. It was a combination seminar series and tours of the Lab where a number of 3D printers were demonstrated. Like many people, if not most, spring is my favorite time of the year. The days are longer, the weather is warmer, foliage is coming back to life, and it’s the season for FIRST Robotics Competition (FRC) all over the country. Eligible participants are male and female high school students — grades 9-12; ages 14-18. For those unfamiliar with the event, every team is given a standard parts list and kit from which to build their robot that consists of mechanical, electrical, electronic, and software components. This, along with rigorous inspection for compliance with the strict rules and specifications before competition ensures that all teams literally compete on a level playing field. I was a volunteer at this year’s Colorado Regional FRC event. My official title was Field Repair/Reset, but in actuality I was a scorekeeper. Once the action starts, it’s non-stop and pretty heated until the competition is done for the day. Between the robots, teams, and fans in the stands, the volume level also remains pretty high throughout the day. A lot of excitement and great fun for me. The game changes every year and this year’s was especially challenging. It involves team-built robots picking up and shooting Frisbees into target goal at varying heights. In addition, there is also a segment of the event that has the robots climb tubular pyramids — the higher, the more points. For safety, if a robot ascends above a certain height, it must be belayed back to the ground with climbing rope and special hardware. There are also two different timed modes for competition — autonomous and teleops. The first 15 seconds are autonomous where the robot must find the target goals on its own and attempt to fling Frisbees into them. The teleops portion of the competition has the robots “driven” by team operators with computers and joysticks. The FIRST events are always well organized, well attended, and well worth the time of everybody involved — participants, volunteers, teachers, parents, mentors, and sponsors. The FIRST event always leaves me with a good feeling about the promise of the future of engineering in the hands, minds, and hearts of those who will create the future. During the most recent SolidWorks World we saw some presentations and live demos of some amazing flying robots, and we discussed them last month. Thanks to the Society of Manufacturing Engineers (SME), we came across another stunning example of flying robots. This time, though, at a much smaller scale as printed circuit micro-electro-mechanical systems (PC-MEMS). Dubbed the Monolithic Bee (Mobee), and created by engineers at Harvard, a unique layering and folding process enables the rapid fabrication of not just these flying microrobots, but potentially a broad range of other electromechanical devices. The new fabrication technique was inspired by pop-up books and origami, allowing clones of robotic insects to be mass-produced by the sheet. In prototypes, 18 layers of carbon fiber, Kapton (a plastic film), titanium, brass, ceramic, and adhesive sheets have been laminated together in a complex, laser-cut design. The structure incorporates flexible hinges that allow the three-dimensional product—2.4 millimeters tall—to assemble in one movement, like a pop-up book. The entire product is approximately the size of a U.S. quarter, and dozens of these microrobots can be fabricated in parallel on a single sheet. “This takes what is a craft, an artisanal process, and transforms it for automated mass production,” said Pratheev Sreetharan, who co-developed the technique with J. Peter Whitney at the Harvard School of Engineering and Applied Sciences (SEAS). Sreetharan, Whitney, and their colleagues in the Harvard Microrobotics Laboratory at SEAS have been working to build bio-inspired, bee-sized robots that can fly and behave autonomously as a colony. Appropriate materials, hardware, control systems, and fabrication techniques did not exist prior to the RoboBees project, so each must be invented, developed, and integrated by a diverse team of researchers. Although tiny robots can now be built by slightly bigger robots, designing how all of the layers will fit together and fold is still a very labor-intensive human task. Standard computer-aided design (CAD) tools, typically intended for either flat, layered circuit boards or 3D objects, do not yet support devices that combine both, but that is changing. However, once a design is complete, fabrication can be fully automated to highly accurate and precise standards. The Harvard Office of Technology Development is now developing a strategy to commercialize this technology. The work was supported by the U.S. Army Research Laboratory, the National Science Foundation (through the Expeditions in Computing program), and the Wyss Institute. Admittedly, the video is more about fabricating the Mobee than it is about it actually flying, but it’s still some interesting stuff. If we come across video that shows the Mobee flying maneuvers, we’ll post it. OK, it’s almost spring and our minds turn to robots, as in the FIRST competition for middle and high school students and started by Dean Kamen several years ago. However, another branch of cool robotics for young people, as well as older guys like me, is LEGO MINDSTORMS. We learned that Autodesk has partnered with The LEGO Group to provide 3D interactive building instructions for LEGO MINDSTORMS EV3, a new platform designed to introduce a younger generation to building and programming robots. Accessible through a mobile app for iOS and Android devices, or over the web at MINDSTORMS.COM, the interactive building instructions—based on Autodesk Inventor Publisher technology—will provide an alternative to traditional 2D paper or online instructions. The 3D building instruction will let LEGO MINDSTORMS builders digitally view how the LEGO MINDSTORMS EV3 components fit together, making it easier to build some pretty sophisticated robots. When building a LEGO MINDSTORMS robot you’ll be able to stop the animation, zoom in on a part or rotate it to see exactly how parts need to be fitted together. Additional features geared toward providing a positive experience for LEGO builders include double-tapping a part for component information, and a Map feature that will let you see exactly which part of the model is being worked on. In case you’re not familiar, in addition to LEGO’s famous bricks, the LEGO MINDSTORMS EV3 set contains a multitude of parts—including motors, infrared sensors and a programmable microcomputer— for creating robots that walk, move or take whatever action they’re programmed to do. LEGO MINDSTORMS EV3 will include the 3D interactive building instructions for five different robots. The LEGO MINDSTORMS EV3 set, as well as the 3D building instruction mobile apps and web instructions, will be available in the second half of 2013. All in all, pretty cool stuff, and something I personally am looking forward to playing working with when it comes available because robots are a big part of the future of engineering and engineers.